We have an Adaptive gear update. The brief article and video, gives us a glimpse at what we can expect in Patch 1.3 Allies. Finally, the in-game social gear is going to be available for more than light armor users. This will allows us who wear heavy or medium armor to take our high level mods and put them into the various pieces of social gear that is in the game now and hints at new social gear to be added. Which one is the tank? Now let’s take a quick look at Adaptive Gear that will be featured in Patch 1.3 Allies. 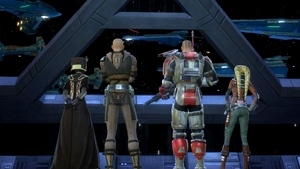 You can also read a bit more from the official article on the SWTOR website. Let us know what you think in the comment section below. What Social Gear are you looking forward to modding out once Patch 1.3 goes live? We now have definite details on Character Transfers. Transfers will be starting June 12th, 2012. Now the way these transfers will exactly happen is a bit more difficult to fully understand, at least for me. What we do know is, character transfers will not be a free-for-all. According to this article from the official game site, there will be certain origin servers that players will be able to transfer from and move to a single destination server. At this time, which servers are the origin servers and which are the destination servers is still not completely known. For single players it seems that other than not knowing, which servers you will be able to transfer from and which you can transfer to, things will just be a slow steady pace. Now there are some issues regarding names. If you decide to transfer to an available server and your character’s name is already being used by someone on the server you are trying to move to, you will have to change your name. The same is true for those transferring and a conflict arises with your Legacy name. Character Transfers still wait & see? Now as far as guilds wishing to transfer, here is where it gets dicey for me. A guild cannot just transfer the entire guild all at once. It will have to be done one player at a time and the guild will have to reform on the destination server. There is also no automatic Guild Bank transfer. If you do have a guild bank unlocked, you have to contact Customer Service, according to the article. There is no mention of what happens to the contents in the Guild Bank. I see this as being a nightmare for any Guild Master/Leader to undertake. Now there is a small glimmer of hope in the last paragraph of the article. It states that this is just the first step and version of Character Transfers. It says also that future transfer versions might allow for some of these other options like moving to specific servers, or easier movement of guilds, but might require a transfer fee. Any future changes on Character Transfers does not have any date or even timetable as to when they will be looking into other possible transfers for the future. I strongly urge everyone to read this article in-depth. I have read through it several times and it is vaguely clear. Joveth Gonzalez, Online Community Manager, did post more about how the this first type of Character Transfers will take place. You can read that post at this link. I know there will be more information to come out about the transfers, but for guilds, in my opinion, I would not attempt to transfer at this time. There are new changes coming in Patch 1.3 for several classes. In an article from Bioware, they talk about the changes being made for tanking classes and dps classes as things that should continue to improve balance and help playing these classes a better experience. One of the major changes has to be of that with the tanking classes and their threat generation. According to the article, any tank in a tanking stance will generate 100% threat, compared to before patch 1.3 when it is only 50%. This means that tanks will be better able to perform their role of keeping the mobs attention. This should help in multiple areas, especially with some of the more challenging Flashpoints and Operation battles. 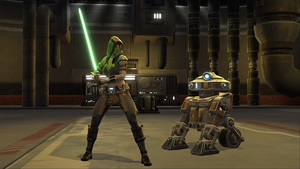 There is also good news for those that tank as Jedi Shadows and Sith Assassins, as the developers are working to make ALL tanks have close to equal “survivability.” Check out the article to see which specific abilities will be changing for each of the tanking classes. Don’t worry Commandos/Mercenaries Bioware is not forgetting you guys. The primary changes for these dps classes is not so much with their damage output, but more on how their classes manage ammo-Commandos and heat-Mercenaries. Take some time to read the article for exact changes for these and all classes mentioned in the upcoming Patch 1.3. All in all, I have to say that Bioware has done a good job at keeping and maintaining balance in the game and that is essential in any MMO. Let’s hope they continue to show the same attention to maintaining and improving class balance. This week was E3, the gaming convention. 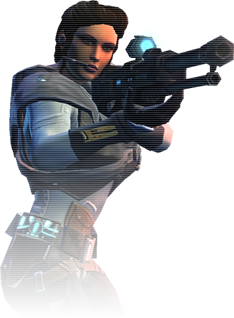 Leading up to the show, this year, there was not much expected to be announced in regards to SWTOR. However, Bioware gave a quick announcement and trailer showcasing what will be coming soon this year. Since that announcement the news has been flying in, so many of us have been working to find out as much new information as possible. So if you have been busy reading the forums or possibly getting PTS downloaded to begin testing Patch 1.3, meanwhile that is downloading why not catch up on the Corellian Run Radio articles. We have them listed below for your convenience. Please take some time to let our writers and podcasters know what you think by leaving a comment in their articles. Here is a video to give you an intro and help build some excitement for a new tournament that will be hosted by TOR-Talk & Tribus. As the tournament video stated, the tournament will be held on the RP-PVP server Jung Ma. Both factions are encouraged to a part of this tournament that is scheduled tentatively for June 23rd, 2012 10pm EST. For more details be sure to read the TOR-Talk’s article and also keep checking their website for any updates on date and time. I strongly urge everyone to download the new update to the Public Test Server and help make sure things in the new patch are right before being added to the live game.